The results of this treatment may not be permanent, and you can experience problems with aberrations in your vision in low light situations and other circumstances. Another risk is that glasses or contacts will still be needed after the procedure, or that you may have vision loss. All of these are usually rare with astigmatism laser eye surgery, and can be treated or managed normally. Laser eye surgery complications are not common, especially since newer methods and lasers are less destructive and invasive. Astigmatism laser eye surgery can benefit many people who suffer from this visual problem, and the pros of the procedure far outweigh the risks in most cases. 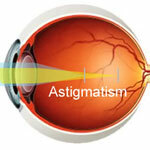 With astigmatism your cornea is not shaped properly, and is not symmetrical as a result. You will experience blurring when you look at objects far away and close up, because of the corneal shape. A laser is used to reshape your cornea, so that it is properly shaped for better vision. All-laser LASIK procedures are very quick, and usually take a half an hour or less to complete except in extreme cases. When you have astigmatism laser eye surgery you will heal faster, have less discomfort, and have far fewer complications and problems than with other methods. Infection risks are very small because of the procedures used, and you will normally have improved vision within a short time after the surgery is done. If you decide to have astigmatism laser eye surgery done there are steps you can take to lower your risks even further. Look at the laser eye surgery reviews online for any doctor or eye clinic you are considering. This will let you know how other patients have felt about the procedure after having it. If negative reviews are posted you may want to choose another provider instead.